Please note! Effective August 1st. 2016 ONACS resigned all affiliations and or association with ONAC Mother Church and established an independent Native American Church, the Native American Indigenous Church Inc. (NAIC). NAIC has NO affiliation or relationship to ONAC Mother Church. This record is for historical purposes only. For information on the Native American Indigenous Church Inc. (NAIC) visit the NAIC church website at SomaVeda.Com. On June 27, 2012 the Oklevueha “Earth Walks” Native American Church INC, a Utah nonprofit corporation and church, declared The Oklevueha Native American Church of SomaVeda to be an independent branch of the ONAC headed by Dr. Anthony James, as long as the trees and grass grow and rivers flow. This charter and recognition was delivered by Chief Executive Officer James Warren “Flaming Eagle” Mooney of the Oklevueha Native American Church INC, a Utah Corporation and Co-founder of the allied and communal Native American Church with the Lakota Sioux Nation Native American Church of South Dakota, and as an American Native Indigenous “earth” based and “healing” religion that is known as the Oklevueha Native American Church and /or NAC. The Charted Declares that Dr. Anthony James is Chief Executive Officer and Julie James is President as long as they walk mother earth. 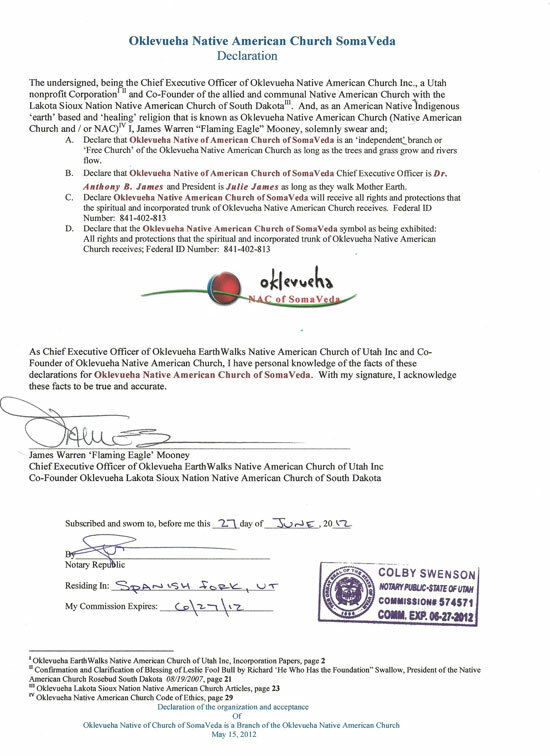 The Declaration further states that The ONACS branch Church under the guidance of Dr. Anthony B. James and Julie James will receive all rights and protections that the spiritual and incorporated trunk of the Oklevueha Native American Church receives. Federal ID Number: 841-402-813. This Charter establishes SomaVeda Integrated Traditional Therapies as a Bona Fide Native Indigenous Medicine and spiritual practice of the SomaVeda ONAC. Please note: The legal entity of ONACS is a fully independent tribal organization with no legal, financial or integrated functions and is not an auxiliary as September 22nd. 2016. All ceremonial and ministerial functions formerly conducted by ONACS are conducted by NAIC. Native American Indigenous Church is in no way related and or responsible to ONAC Utah and is in an integrated Auxiliary of the Priory of Saving Grace Church.